Keeping in mind the various demands of our customers we are engaged in providing an extensive range of Packing Bubble Wrap. Bubble wraps provide a protective layer around items within shipping boxes or envelopes to prevent damage. Each type of packing fill specializes in protecting certain material, so using bubble wrap and packing tape together, you can keep anything safe. Preventing damage reduces the risk of having to send expensive replacement items. 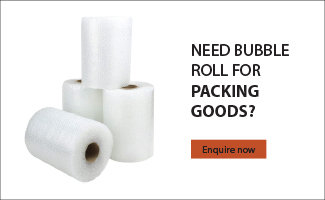 Bubble wrap rolls and other bubble packing materials are flexible and versatile. Use bubble roll sheets to wrap securely around any item and, with a little nudging, you can protect small nooks in pieces, such as delicate statues or electronics. Bubble material absorbs shocks and provides a buffer that keeps wrapped materials safe. These bubble wraps are manufactured utilizing supreme quality raw material which we obtained from the certified and authentic vendors of the market. We also assure to deliver our products in a stipulated time line.